It's easy to say things are being worked on, without actually giving any information out. It's easier to not say anything at all, since if you fail in some aspects no-one will know. We, however, like the hard way! And it's because of this that over the new few posts, we'll be going into some of the designs for the site, and explaining some of the features. The designs here are all wire-frames at the moment; we do have full colour and details designs for most pages thanks to the hard work of Mother Tereza, but they're not quite ready for public consumption yet. Figure 1 above shows the wire-frame design for the main page of TF2 Center. Users will spend the majority of their time there, and so it's important for us to get this page right. We're adding as much information as we can onto this, while (hopefully) keeping it simple and intuitive to use. It's a change to what lobby players will be used to, but we feel that's a good thing! 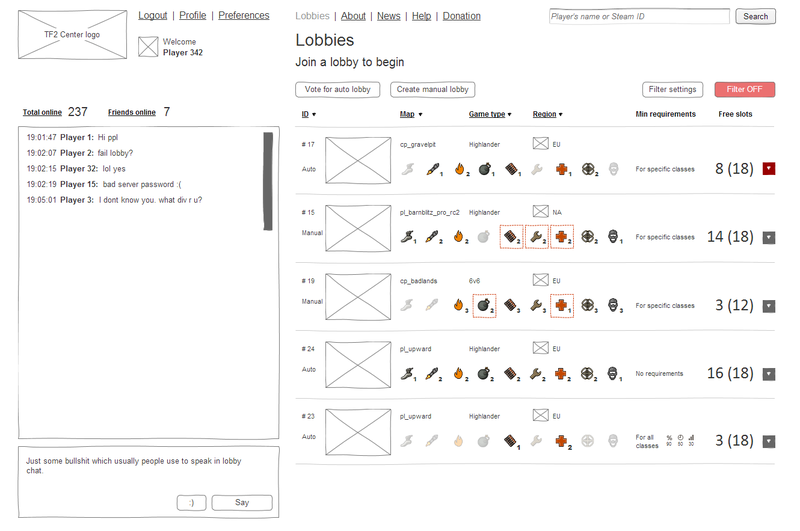 Figure 2 shows a lobby summary, and is typical of what you'd see on the home page. The basic lobby information is there - map, match type, location - as well as showing not only the classes needed but also how many of each. We also introduce restrictions into lobbies. The above example shows that there are restrictions on certain classes, and from the homepage users can open any lobby summary (Figure 3) to see more details about that specific lobby, without having to go into the lobby or leave the homepage. There are a few things of note here that we feel will really enhance lobbies. The first new detail of note is slot reservations. Particular classes can be reserved by the lobby leader during creation and protected with a custom password, so that your friends can join without needing to rush in. Players being kicked because the lobby leader is saving a slot will hopefully become a thing of the past, and will make the experience better for both lobby leaders and players alike. Class restrictions are also introduced here. Restrictions can be placed on an entire lobby or on specific classes, and can be any combination of matches played on TF2 Center, match reliability, and playtime on TF2 obtained through the Steam API (either in total, or on a specific class). 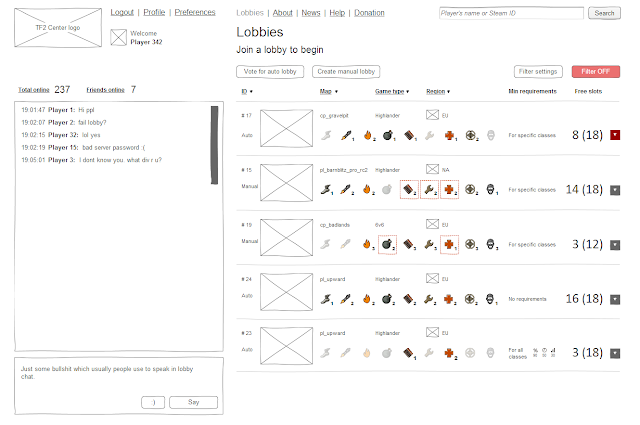 Restrictions are set by the lobby creator, and can be fully customised. Hopefully you agree with us that this shows off some of the features we're introducing. We're aiming for a clean and clear user interface and if you have any thoughts or questions, as always please feel free to get in touch (either through comments here or directly over steam). In the next post, I'll be going into some of the designs of the lobby page itself, so expect to see that posted over the next few days.